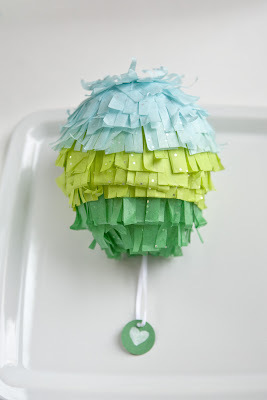 Juneberry Lane: Tutorial Tuesday: DIY Mini-Piñatas for a Cinco de Mayo Good Time . . .
Tutorial Tuesday: DIY Mini-Piñatas for a Cinco de Mayo Good Time . . .
Oh my goodness, can you believe it is nearly May?! Summer is almost here and it is time to start having some fun!! And what better way to open the gates to the warmest season of the year than to kick things off with a Cinco de Mayo Celebration?! Need a bit of inspiration to get your party wheels a-turning? Well don't worry, we'll be sure to send a few things your way in the days ahead. 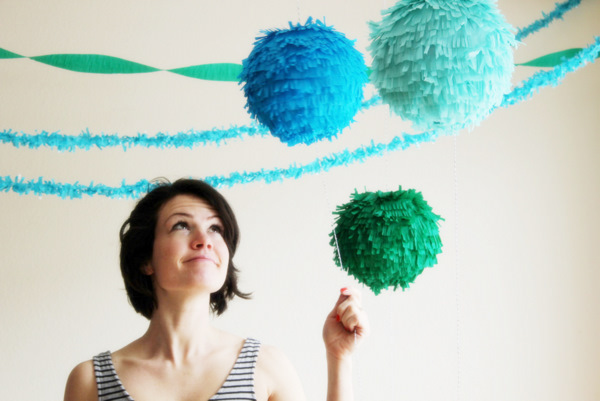 But first, let's get the ball rolling with a fun little project from the Ruffled Blog to get you in the spirit of things...DIY mini-Piñatas!! Take a peek . . . 1.) Blow up balloon to desired size and tie with a knot. Ours were about 5-6 inches long. Rip paper into small pieces – strip or square shapes are great, but really any shape will do. Mix equal parts of water and flour for papier mâché glue paste. 2.) 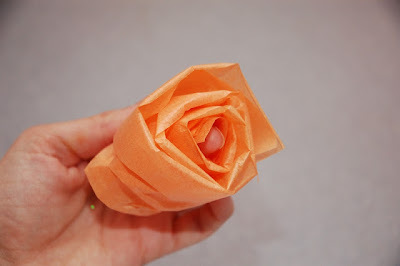 Start gluing pieces of paper onto balloon, allowing an opening around the balloon tie for candy once it’s dry. We didn’t bother with a brush to glue the pieces and went straight to using my hands – another tip to speed up the process. Once your balloon is covered with its first layer of paper, let it dry for a few hours. Repeat the process until is thick enough to hold candy without the shell breaking. Three layers were sufficient for me and sturdy enough that they wouldn’t break if they fell on the floor, but you can add more to make them stiffer if you’d like. 3.) While your papier mâché dries, you can get your tissue paper ready. Again, we batch fringed tissue paper by folding a long strip of paper (about 4 inches wide) in half lengthwise so it’s 2 inches wide. Then fold the paper the other direction a few times and cut 2/3 of it’s width, so my paper was 2 inches wide, I cut slits of about 1.50 – 1.75 inches wide. To save us a little more time, we didn’t bother measuring measuring how wide each strip should be. 4.) 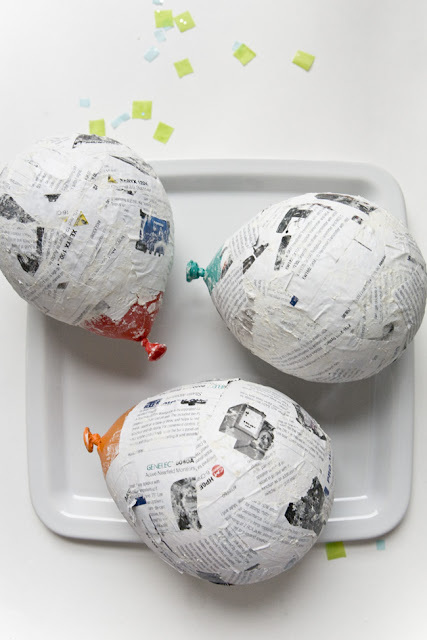 Once your papier mâché is dry, you can start layering your fringed tissue paper. 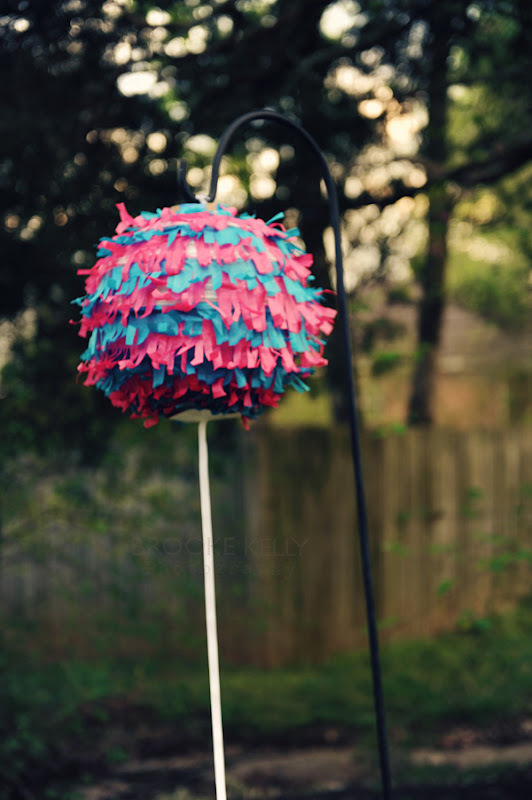 I went against my own advice on this particular pinata and started from the top down. Don’t do that. By the time I was finishing gluing the last layer, the fringes on the top were wrinkled and some ripped. Always start layering the fringe from the bottom up. Here I used school glue, but I think flour paste could work too (but I’d use a brush since tissue paper is much more delicate than newspaper). I used three layers for each color tier. 5.) With a needle, gently poke a hole on the balloon to deflate it. Pull balloon out and we’re ready to add the candy! 6.) 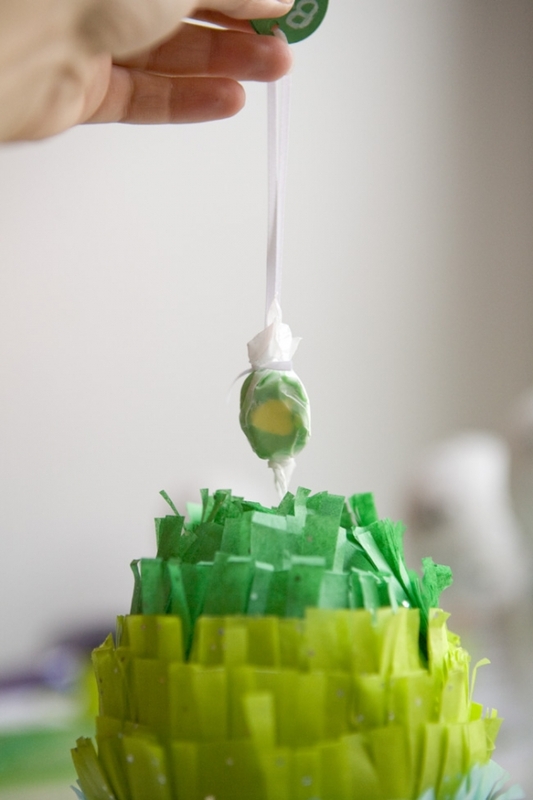 To create a handle for the mini piñata, thread a tag in a ribbon and make a knot halfway. Tie the ends of the ribbon onto a candy. 7.) 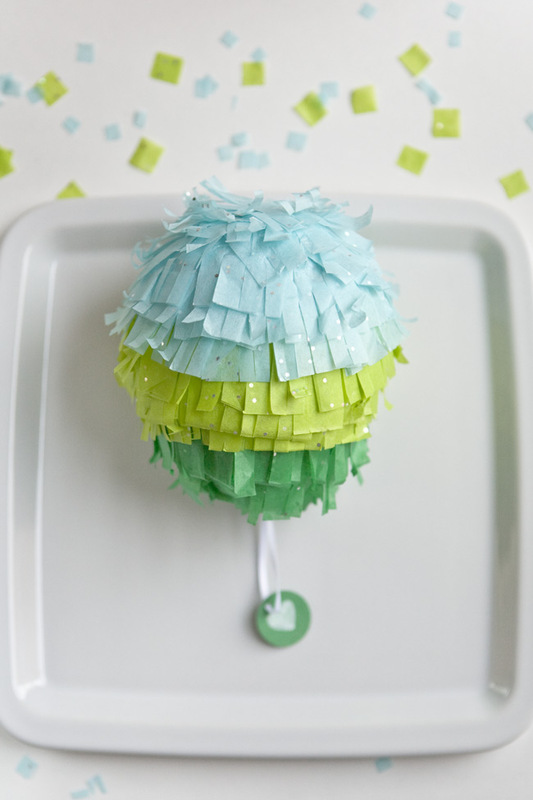 Now you’re ready to add candy and seal the pinata. Add the handle last and seal the pinata with a matching piece of tissue paper. 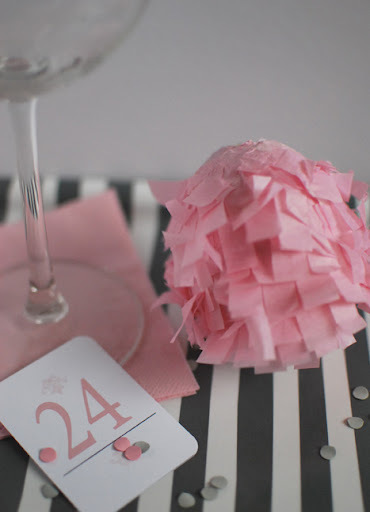 *** You will use a little less than 20″x8″ worth of tissue paper per colored tier for each piñata favor. 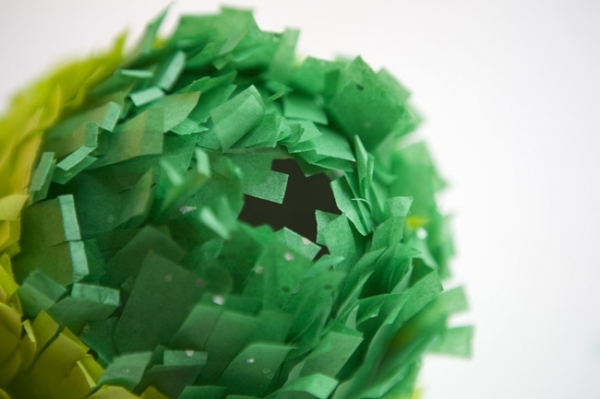 You can reuse the scraps of paper to create confetti to add in each pinata along with the candy. 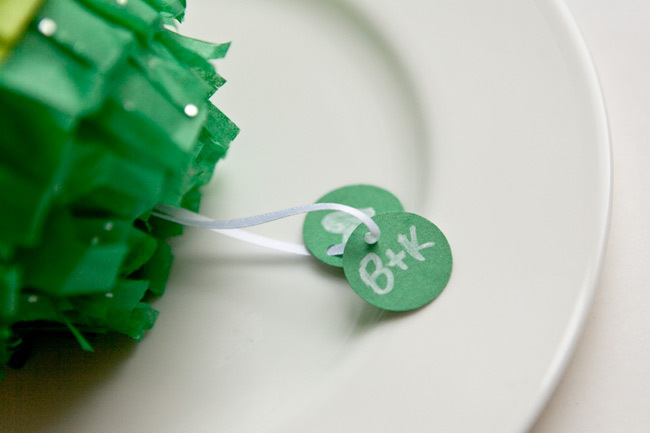 The specific type and colors of tissue paper above are are Emerald, Peridot, and Aquamarine. The glittery paper is called gemstone tissue paper, and it can be found online at places like this. 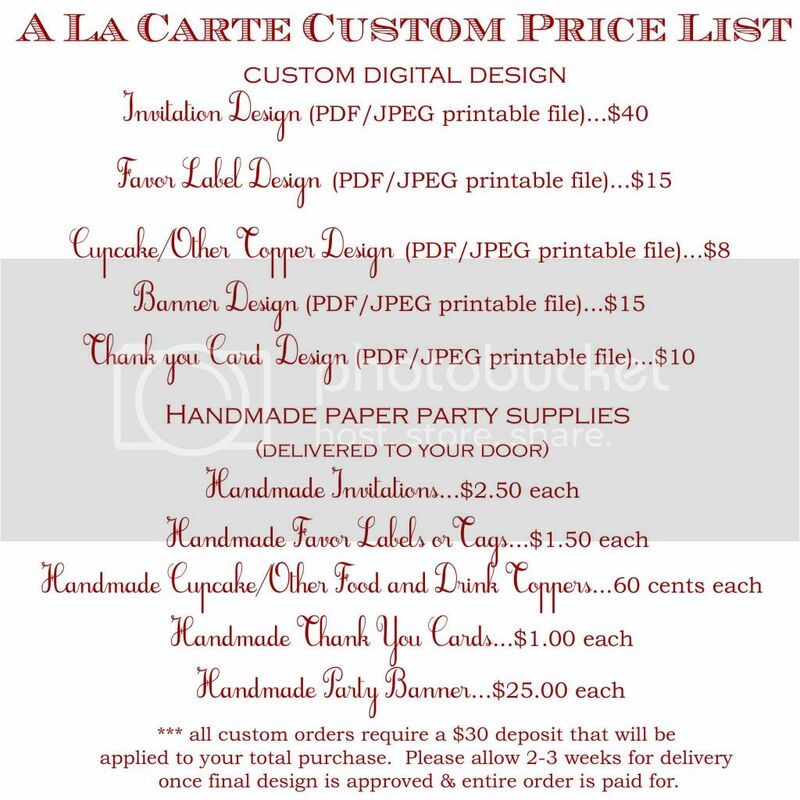 Total cost for each piñata favor is under a dollar including the candy:) SCORE!! 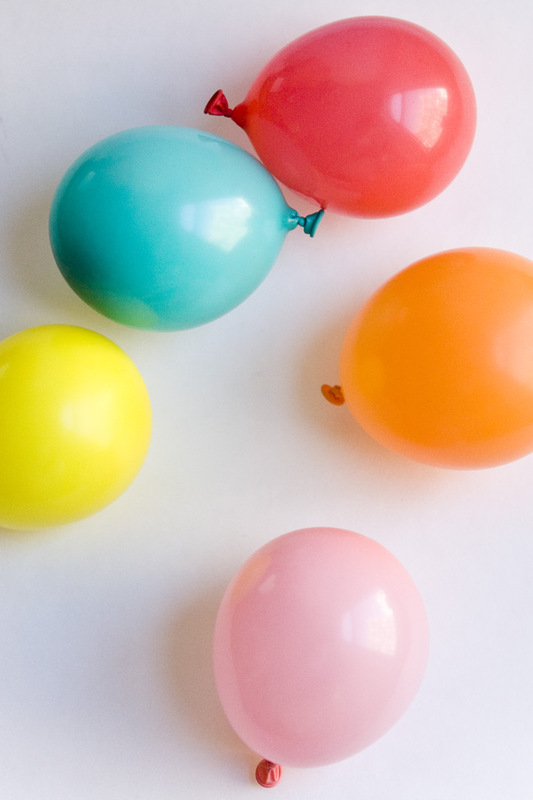 And how much fun would one of these be for a Gender Reveal Party? 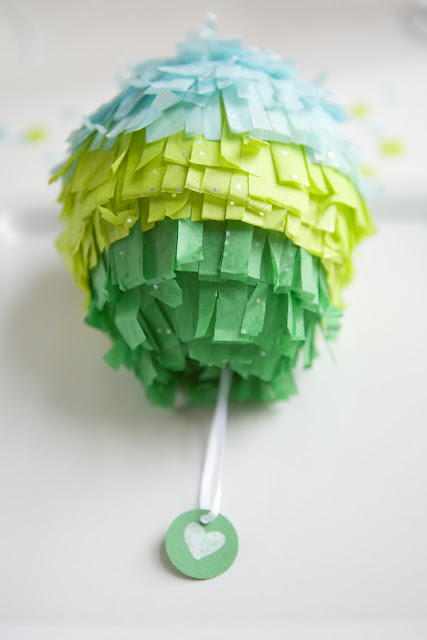 You could fill the inside of the balloon with pink or blue confetti or whatever little pink or blue treat you can think of...when you pull the string on the Piñata "SURPRISE!! It's a . . . !" 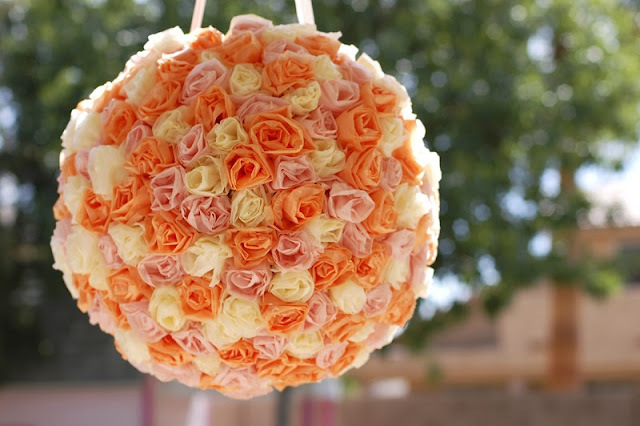 Wouldn't a beautiful blooming piñata be amazing, decorated with pink & blue flowers and full of pink or blue confetti? The main points of the tutorial are the same, except for the flowers and a bigger balloon of course! For directions on how to make that lovely number above, visit Kate Landers HERE . 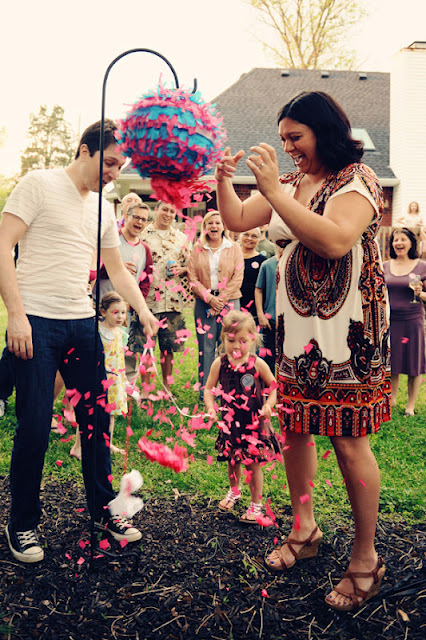 . .
We'll leave you with a real-life Gender Reveal caught on camera . . . 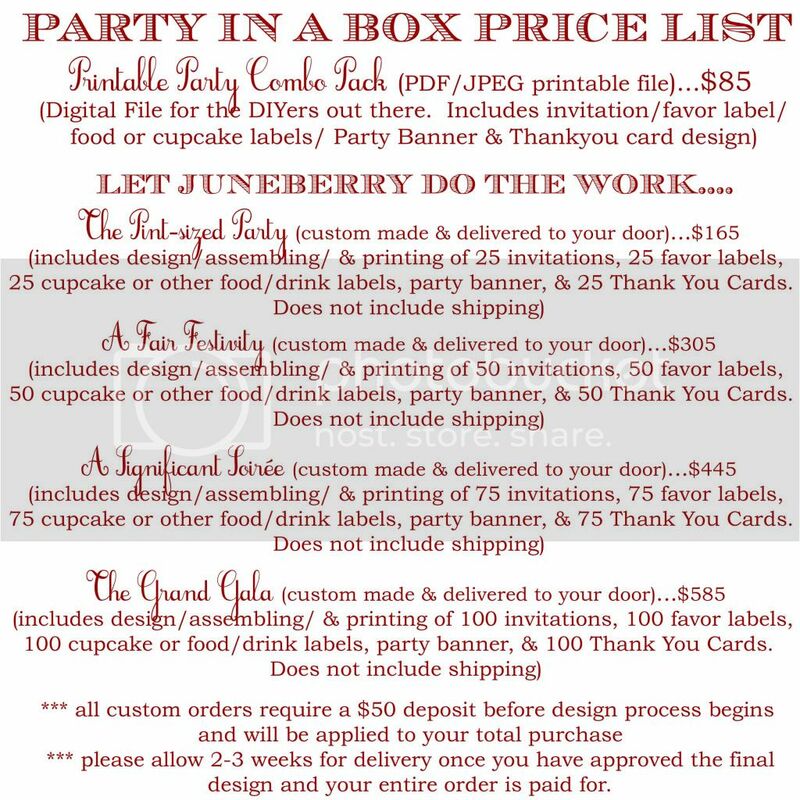 Okay, so whether you are planning on having a rousing good time this Cinco de Mayo or are planning on revealing the gender of your baby to your family & friends in a way full of fun, this little project is sure to add some life to the party!! Have a wonderful Tuesday! !